Fourth Iranian satellite, and Iran's first successful orbital launch since February 2012. Fajr (Aurora) had a technology payload with a cold-gas thruster developed by Iran Electronics Industries. There is suggestive evidence (mostly based on satellite imagery of launch pad damage revealed by the magazine Jane's Intelligence Review) that Iran had two launch failures in 2012, as well as more speculative evidence of further launch failures since then. The satellite did not seem to make any orbital maneuvers. The orbit decayed from an initial 223 km x 470 km to 196 km x 293 km by February 22, and then after falling to 134 km x 155 km early on February 26 it reentered. The Safir rocket stage orbit decayed a bit more slowly, and was at 203 km x 325 km on Feb 26. 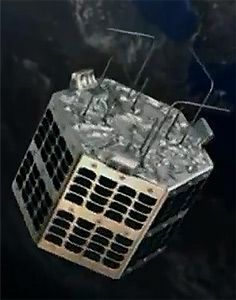 Technology satellite built by IEI (Iran Electronics Industry), Iran. Launched 2012 - 2015. Status: Operational 2015. First Launch: 2015-02-02. Last Launch: 2015-02-02. Number: 1 . Gross mass: 52 kg (114 lb). Apogee: 469 km (291 mi). Family: Surveillance. Country: Iran. Engines: Nodong. Launch Vehicles: Safir. Launch Sites: Semnan. Bibliography: 6492, 12377. 2015 February 2 - . 08:50 GMT - . Launch Site: Semnan. Launch Complex: Semnan. LV Family: Nodong 1. Launch Vehicle: Safir. Fajr - . Mass: 52 kg (114 lb). Nation: Iran. Class: Surveillance. Type: Surveillance satellite. Spacecraft: Fajr. Decay Date: 2015-02-26 . USAF Sat Cat: 40387 . COSPAR: 2015-006A. Apogee: 469 km (291 mi). Perigee: 224 km (139 mi). Inclination: 55.50 deg. Fourth Iranian satellite, and Iran's first successful orbital launch since February 2012. Fajr (Aurora) had a technology payload with a cold-gas thruster developed by Iran Electronics Industries. There is suggestive evidence (mostly based on satellite imagery of launch pad damage revealed by the magazine Jane's Intelligence Review) that Iran had two launch failures in 2012, as well as more speculative evidence of further launch failures since then. The satellite did not seem to make any orbital maneuvers. The orbit decayed from an initial 223 km x 470 km to 196 km x 293 km by February 22, and then after falling to 134 km x 155 km early on February 26 it reentered. The Safir rocket stage orbit decayed a bit more slowly, and was at 203 km x 325 km on Feb 26.